As a buyer, I was wondering why I should bring the new Spiderman 3 soundtrack into my stores. So, I started reading through the tracklisting, Snow Patrol (ok), The Killers (ok), Yeah Yeah Yeahs (sold). Record Collection knows how to put a soundtrack together with all new songs from Snow Patrol, Yeah Yeah Yeahs, Jet, The Flaming Lips, Wolfmother, The Walkmen, The Killers and more. The soundtrack even has a website. See the full track listing here. She (My Brightest Diamond) did an awesome in-studio performance for KCRW while she was at Sxsw. It’s a whole hour of talking and singing, including a never-released Edith Piaf cover. You can find that interview and performance here. In fact, KCRW is hosting a My Brightest Diamond show in LA at the Troubadour tonight. Please go and tell Shara I said hey. 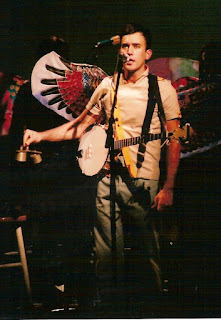 So, here are the live Sufjan Stevens tracks from a show at the Fox Theatre on September 21, 2006. Buckman Arts Magnet Elementary School in Portland is holding an auction. They have 10 items on ebay and will also host an event at the Melody Ballroom tonight at 5:45pm. More details here. Most of the items on ebay are kid sized guitars that have been individually decorated by Portland Artists. 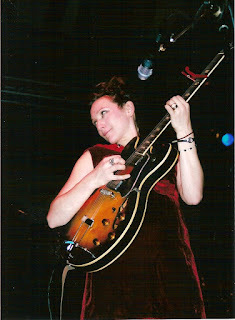 Corin Tucker (of Sleater-Kinney) decorated the guitar above. Janet Weiss (now of The Jicks) decorated one as well. Members of Modest Mouse, The Decemberists, The Dandy Warhols, Quasi, and more lent their hands. Bid for the items here. One of the cds that was released today was A Tribute to Joni Mitchell. There is a varied array of iconic-artists-in-their-own-right that pay homage to Ms. Mitchell. Sufjan Stevens, Bjork, Caetano Veloso, Prince, Emmylou Harris, Annie Lennox, Elvis Costello, KD Lang and others lend their vast talents to interpreting Joni’s songs. I was going to post the Prince song, ’cause it’s killer and Prince fans are freaky and old-school like me. They will buy the cd even if they’ve downloaded the song. They like to hold something and thumb through the artwork. We are complete-ists. You new school kids are weird to me, but I bet you have a lot less to lug around. If you’re new school, it’s not too hard to find the full version of this song, but here’s a teaser to entice you to actually spend money on this well done tribute. I’ve been a fan of Holly Golightly‘s since seeing her play at sxsw many years ago. You may know her as a friend of the White Stripes singing on their song “It’s True That We Love One Another.” She’s also been a frequent collaborator of the prolific Billy Childish. Her new album You Can’t Buy a Gun When You’re Crying on Damaged Goods is already out in the UK, but due out in the States in May. more new songs at their Myspace page and Holly’s Myspace page. Okay, well i was going to post a song off the new Tori Amos album American Doll Posse, but many people have already beat me to it. One track at popbytes and two at Fabulist!. Brooklyn Vegan is one of the 5 I read everyday. His post today has some great pics of Beth Ditto of The Gossip. My advice don’t read the comments after them. Some people are not so nice. See his pics here. Anyways, his post is what brings me to “premier” my video of The Gossip from Sxsw. The quality is not so good from my little camera, but the content is great. This group gives 100% on stage. My favorite shoe store (and the shoe store of the Beastie Boys) Harputs is throwing a party. They’re 10 years old now and want you to help them celebrate on April 27th in San Fransisco. Rachel Yamagata, Michael McDermott, and The Nice Device will help them raise money for an organization called Our Conservatory. It’s a musical instrument library that helps at risk kids find their passion thru music. The Nice Device is from Detroit, but is not in the typical vein of the motor city garage or soul sounds. Instead, they make pop music. The Brits are already hip to them. You can vote for them at NME. Hear more at their myspace page.